"The ISO-MICRO-GYM is a system for all ages and ability that does live up to it's claims" - Great Physical Culture Historian - Gil Waldron. You can see much of Gil's great work on the Renowned SANDOW PLUS website. Hi, I'm Keith Fairfield and at 57 (see photo' age 67) these exercises were key in rebuilding my body after a serious road traffic accident took me out for over two years. Exercises I had learned at the age of 16, inspired by the "ISO" masters like Charles Atlas, George F Jowett and Alexander Zass (The Amazing Samson). Isometrics are used in the physical fitness training of the US Marines, the S.A.S. and other "special forces". Todays athletes and their coaches swear by isometrics. Exercise techniques I have used all my life and now (June 2010) put together in the unique ISO-MICRO-GYM flip chart. A review on Amazon UK by Alex from Surrey :- "This book is the greatest exercise book ever published and the results you can achieve with intensity and doing this at least once a day are limitless I think I have given out at least ten copies and keep two spare at home, I take it everywhere with me. The reason it is not promoted by the fitness community is because you cannot make a lot of money out of it but this book is phenomenal. I have played 6 hr Australian football tournaments off the back of just doing this and found myself fitter and stronger then all others I played on the field. It's consistency and intensity which will give you the best results and as you learn to feel your body more you will realise how effective this book is." Burn fat and build muscle. Whether your young and fit or recovering from injury or illness you will be amazed at the results you can achieve with these proven techniques, techniques that don't require any equipment. Amazon UK review :- "Super fast service from Kieth Fairfield. I've also searched around the internet to try and find another product like this. Failed! These exercises are the business. I used the bullworker many years ago to great effect. I just wish I'd known about these exercises then. I am also 57 and wanting to get my strength back. I've started using this program and boy do my muscles ache! Don't bother with all those expensive weights when this simple isometric program will do the trick. Many thanks for this Keith". "A great exercise system that really does work. I have seen and felt the difference within two weeks. I use the isometric exercises alongside my Mixed martial arts training to keep working my muscles whilst i'm away from the gym or unable to train due to injuries but can also see how this could be invaluable for rehabilitation purposes too". Gareth from Grimsby age 30. Sue from Brighton emailed me after I contacted her on her 2nd order for the ISO-MICRO-GYM. 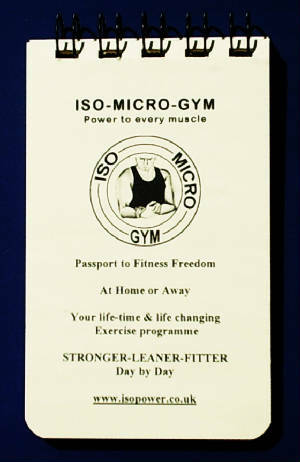 "Dear Keith, Thank you for your email, and yes I have benefited from the ISO-MICRO-GYM. Many people have noticed my flatter stomach and have been amazed how this has helped me through very stressful times when I haven't had much time to exercise. I loaned the book to a friend and as they are now benefiting from it I re-order one for myself - the other is for another friend for Christmas - she was extremely obese but with help from her doctor has now lost a lot of weight and asked me what the secret of my flattening stomach was so I thought this was a good Christmas present for her. I am so glad I spotted this in the Caravan magazine it has so improved my body image. Resistance training builds strength of muscles, bones and surrounding soft tissue as well as burning off calories fighting the ageing process in both men and women. Hi i'm Sarah, 41 years old (see photo') from Market Rasen Lincs! I have been doing isometrics now for about ten weeks and i'm delighted with the results. Ten years ago i had a major operation which left my stomach considerably scarred. Due to this i lost self confidence and would never wear a bikini on a beach. Through these exercises i now have a body in which i am happy with, so this year i was proud to wear a bikini on holiday! Thanks so much for giving me my self esteem back. "Thought I would see how I got on over a period before responding. My wife, who broke her arm quite badly a couple of years ago and myself, who has had two serious operations one on my lung and one to remove a tumor from my spine, have been carrying out the exercises everyday since receiving the flip chart. More recently I have increased to two sessions a day and the benefits we have both noticed have been really pleasing. Coupled with a healthy eating policy we have also lost half a stone each and both of us feel stronger and healthier. The problems of the tumor on my spine impacted on the nerves causing me great difficulty walking and therefore my whole body seemed to get weaker as a result of inability to exercise properly. My core strength has improved now following the exercise routine and this is also helping me walk better and generally move about easier. My target is to be able to jog gently! Thanks for your inspiration and flip chart. Already training with dumbells - kettlebells or sophisticated equipment? Add these exercises to your daily routine and take your strength to the next level. Famous Strength collector and Physical Culture enthusiast Kev The Rev submits his 6 weeks results :- Hi Keith, It is 6 weeks to the day since I started the ISO-MICRO-GYM exercise programme. I got weighed in this morning and I'm down to 17 stone (238lbs) and delighted that I've lost a stone (14lbs) in weight. I am on the right track and feel like a new man again also having to buy new clothes that fit. The course works wonders for those who are dedicated and care about ones health and strength. Many thanks again. Kindest regards Kev The Rev. 55 years young again. Reshape your body in just 6 weeks. The pocket size flip chart makes this system readily available anytime, anywhere. Just follow the illustrations and instructions on each page to guide you through the programme. I received this email from Peter of Hertfordshire two weeks after receiving the ISO-MICRO-GYM :- "Hi Keith, many thanks for your message. I have delayed in replying to you so I could try out the ISO-MICRO-GYM moves and must say that I am delighted with the results and how simple the programme is. I now perform every exercise only twice a week due to work and other commitments (after using weights for a few years) just to keep toned and feeling I am building muscle also. It is saving me loads of time, space and money". Peter also ads :- "I have stopped the weight training for the time being as my physique has got to a level that i am really happy with and space and time restrictions at home (where i have all my weights) meant that I just wanted to find an exercise routine that would maintain what i have achieved - your program does that , and more". You will build muscle the PROVEN and guaranteed way and get results that will make you feel great and look great every day, minute by minute as you begin to build your body naturally. With these simple isometric and isotonic exercises you can reclaim your lost energy, feel and look younger in no time at all as you burn off your stored fat and build solid, lean muscle. Do the exercises in one 15 minute workout, or if you are recovering from injury or illness you can do them throughout the day as time and energy allows using the pocket sized flip chart to guide you through the programme. That's another beauty about these exercises - they can be done as gentle or as dynamic as your body will allow. Working to burn off stored fat and build solid, lean muscle. ISOMETRICS - The definition - isometric exercise is a form of exercise involving the static contraction of a muscle without any visible movement in the angle of the joint - the term " isometric " combines the prefix " iso " (same) with metric (distance), meaning the length of the muscle does not change as compared to isotonic contractions ( "tonos" means "tension " in Greek) in which the contraction strength does not change but the joint angle does. There are 100's if not 1000's of books explaining why and how these type of exercises work - The ISO-MICRO-GYM is not padded out with information you can get elsewhere, but contains a proven System incorporating isometrics and isotonics giving you the best of both worlds to build a great shape in the simplest and quickest of formats. If you feel you are under weight - do these exercises and with a healthy diet you will build a body of Solid, Lean Muscle. Over two years of pain and inactivity causing muscle wastage and unwanted fat following a serious car accident, and a major operation to place two titanium cages in my neck my body faced a challenge, but with these AMAZING isometric and isotonic exercises and having to start off gently it still took only 12 weeks to get my body back in shape, EVEN AT 57. And now at 76 still benefiting from the daily routine. That's how I know that if you are looking to build a body of solid, lean muscle whilst burning off stored fat, young and fit or recovering from injury or illness the exercises in the ISO-MICRO-GYM will give you amazing results - fast. "The ISO-MICRO-GYM is a system for all ages and ability that does live up to it's claims" - Great Physical Culture Historian - Gil Waldron. To pay by cheque or P.O. and "special discounts" - please find my details on the "contact me" page - thank you. Cick here for details of the downloadable version for just 99p on Amazon.co.uk Thank you if you have already done so and please don't hesitate to email me if you have any questions. for just £6.47 incl. p&p. (UK & NI) See below for World Wide postage - Thank you. To be an affiliate in your own country to beat high international shipping costs please contact me to discuss terms and discount rates - Thank you. For WORLD WIDE dispatch please CLICK the Paypal (BUY NOW) button on the left. For European Union dispatch please CLICK the Paypal (BUY NOW) button on the left.